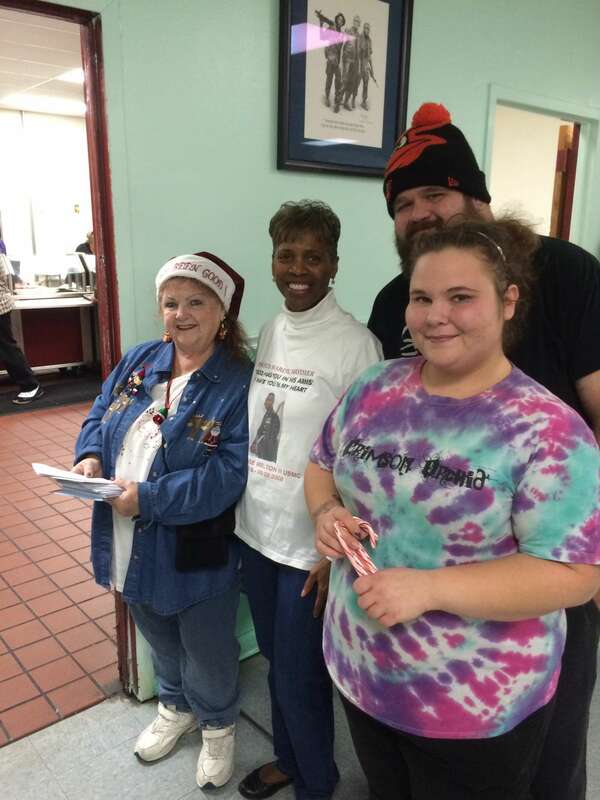 The MCVET Christmas Community dinner was held on Monday December 22, 2014. 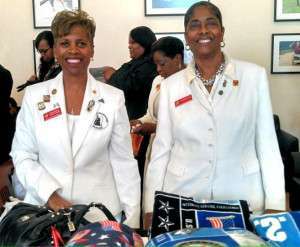 Members of the MD Chapter were asked to help with serving the Veterans in addition to their community organizations. 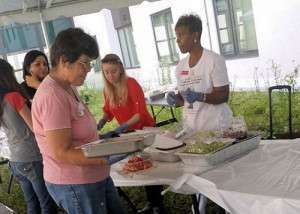 One of the Baltimore Raven’s players also came out to help with the serving. It was an honor to not only serve them, but to also eat with them, enjoy the evening activities and to listen to the MCVET Choir singing some of the popular Christmas songs. Community Volunteer and Janice Chance serving at first food station. Michelle Murphy, community volunteer and a Baltimore Ravens player. Michelle , Ravens player and Janice. Members of the MCVET Choir. 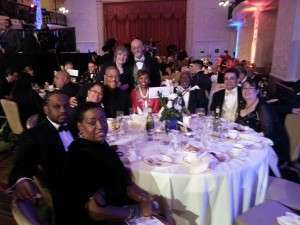 Medical Musical Group’s (MMG) 2nd Interfaith Holiday Gala to benefit Wounded Warriors was held at the Rachel M. Schlesinger Concert Hall in Alexandria, VA. Gold Star Families, Veterans and Active Duty Service members were invited as special guests. The Host for this event was Chuck Todd, CBS “Meet the Press” moderator. In addition, Eleanor Clift of the Daily Beast; Janet Parshall, local Radio Host; and Edward Chow, Jr., Maryland Secretary of Veteran Affairs narrated several beautiful holiday readings. Theresa Mills, Chuck Todd and Janice. Several Veteran Service Organizations joined the “Sons of The American Legion” to serve and presents gifts to the residents at the center. The MD Chapter was included in the group. 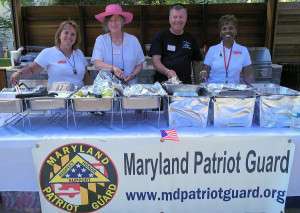 We all had a Great Time serving and spending time with our Heroes. Hundreds of volunteers assisted with laying wreaths on the graves of our nation’s HEROES. Several MD Chapter family members participated and also placed a wreath at the graves of their Hero. Gary and Cindy Lohman, and Theresa Mills along with several other family members and friends. Janice Chance salutes son Captain Jesse Melton III USMC after placing a wreath. 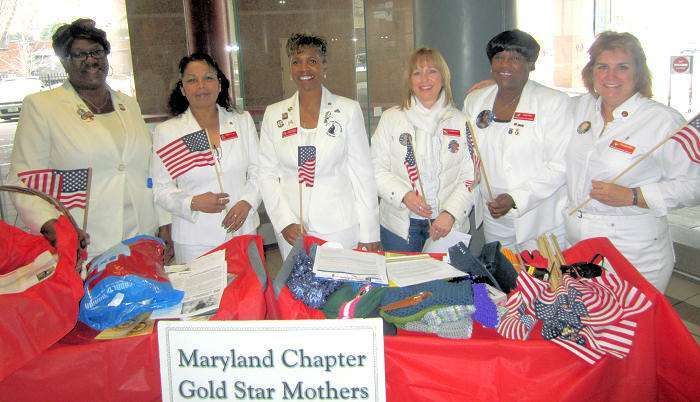 Several MD Chapter Gold Star family members attended the Honor and Remember Fifth Annual Gold Star Family Evening. It was a tribute to Our Fallen Heroes and their families. 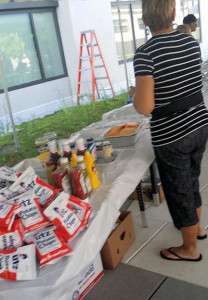 The event was held at the Founders Inn in Virginia Beach. 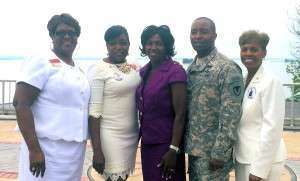 Pictured from left to right: Charlton & Janice Chance, Theresa Mills, Michelle & Kenmore Murphy. Gold Star Mothers and families were invited to attend a Veterans Day Ceremony at the Jacksonville Senior Center in Phoenix, MD. Admiral Dale Horan US Navy was the key note speaker. There were over 200 Veterans in attendance, two of who had been POW’s. It was a very moving ceremony. L/R Michelle Murphy, Yvonne Green, Admiral Horan, Janice Chance. Janice, Michelle, Yvonne, and Front Edith Canapp ( Vietnam Mom). Janice, Michelle, Yvonne with Bob & Edith Canapp ( Vietnam parents). 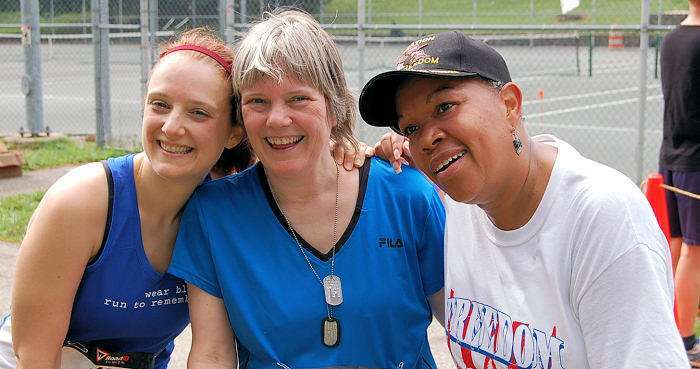 Janice Chance, Michelle Murphy, and Donna Robinson saluting the Veterans. 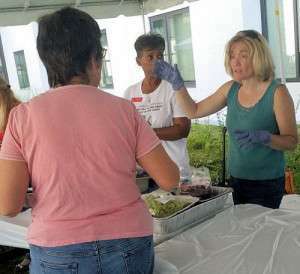 On November 8, 2014 National Volunteer day Janice Chance was invited by Kip Guen a member of the Johanniter’s a non profit charitable organization to assist his team in preparing and serving breakfast to service members and their families that were staying at the Fisher house located at Walter Reed National Military Medical Center. It was truly an honor to serve. tribute to all of the moms. We were also given a beautiful white silk rose and a small flag. It is a ceremony that deeply touched us all. 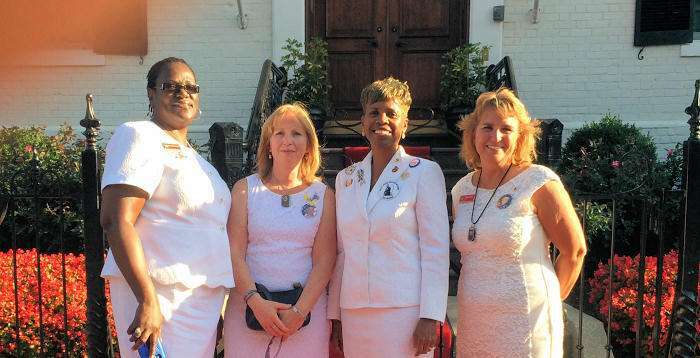 (Left to right) Janice Chance, Mary O King, Donna Robinson, Michelle Murphy and Theresa Mills. 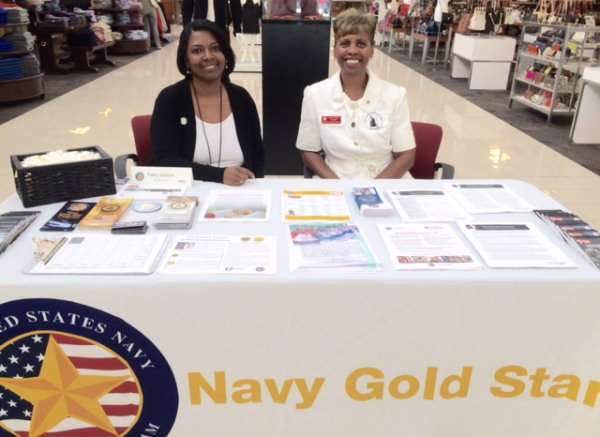 On September 26, 2014 the Navy launched their new Gold Star Program at the Walter Reed Military Medical Center Bethesda. Their Coordinator Patsy Jackson set up an outreach table at the NSA Bethesda NEX with the Maryland Chapter Gold Star Mother’s Chaplain Janice Chance to help spread the word about the program and what it means to be a Gold Star Family Member. Click here to visit the Navy Gold Star Facebook page. Patsy Jackson and Janice Chance. 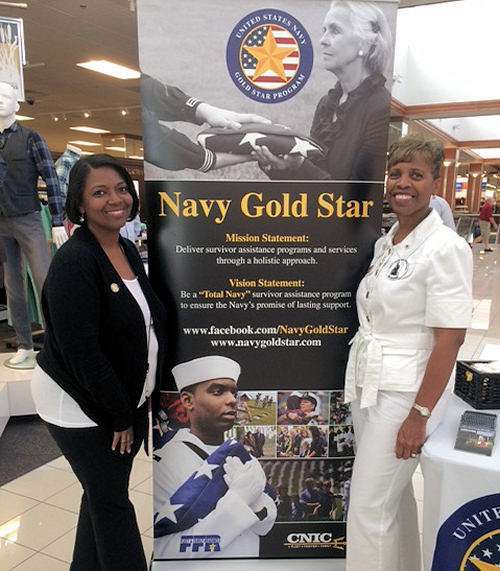 The Garrison honored the mothers of fallen service members at Fort Meade’s Gold Star Mothers and Families Day event on September 25, 2014 at the Potomac Place Neighborhood Center. The guest speaker was Mrs. Monique Ferrell, deputy auditor general of Manpower, Reserve Affairs and Training Audits. 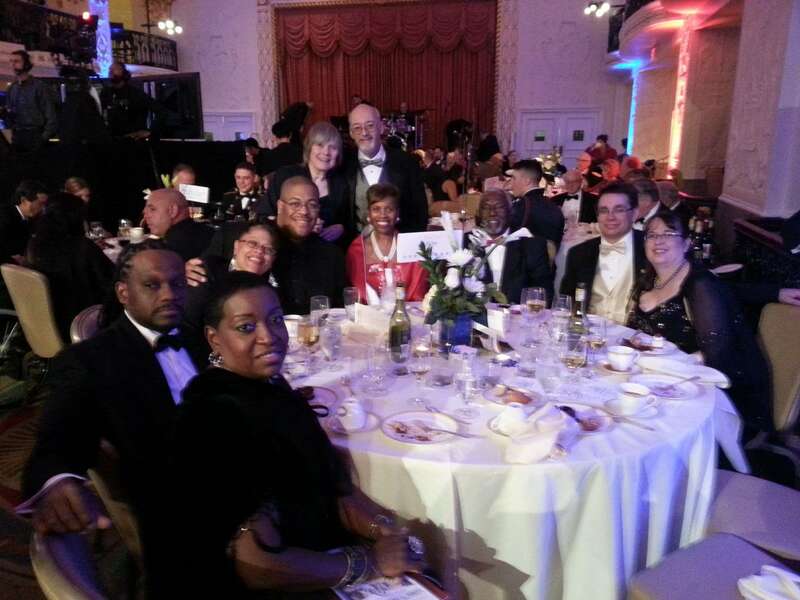 Mrs. Ferrell is the wife of Lt. Gen Robert Ferrell, Chief Information officer G-6 at the Pentagon. 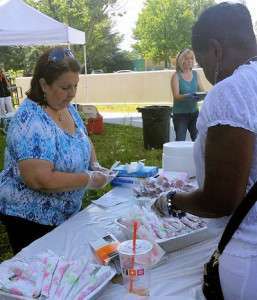 The tribute was sponsored by the Fort Meade Survivor Outreach Services Program headed by Mrs. Voncile Farmer SOS Coordinator. It recognized the sacrifices of Gold Star Families and our fallen loved ones. 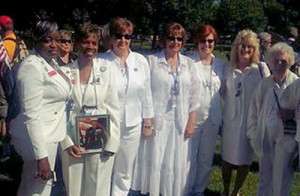 (Left to right Donna Robinson, Yvonne Green, Lee Ann Doerflinger, Janice Chance, Michelle Murphy, Mary Wiley and Theresa Mills. On August 29, 2014 Gold Star Moms and dads were invited to attend a special VIP reception for several Marine Medal of Honor recipients that was hosted by General James F. Amos and Mrs. Amos at their home. They were also invited as special guests to the Marine Parade. On the Red Carpet in front of the Commandant’s home Donna Robinson, Regina Barnhurst, Janice Chance, Theresa Mills. VIP Reception. L-R Charlton Chance, Donna, Theresa, General Amos, Janice, Regina and Robert Roddy. 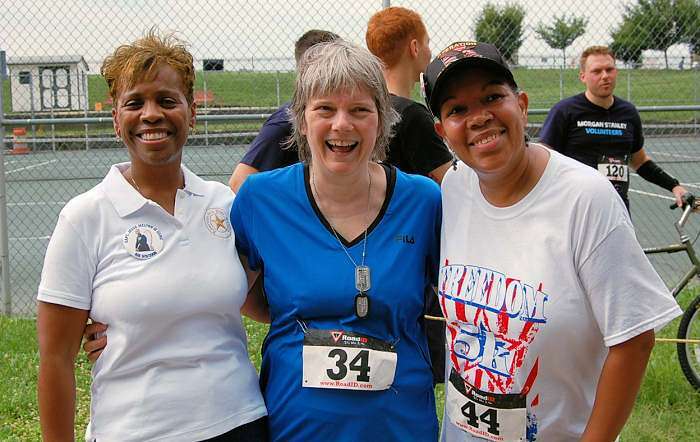 L-R Janice Chance came out with the intent of just supporting her fellow Gold Star Sisters Lee Ann Doerflinger and Yvonne who were registered to run the 5K, but decided to join the group who were walking the 5K. Thankfully we all completed the 5K !! Anna Bevill (Lee Ann’s daughter), Lee Ann, and Yvonne who all completed the 5K. 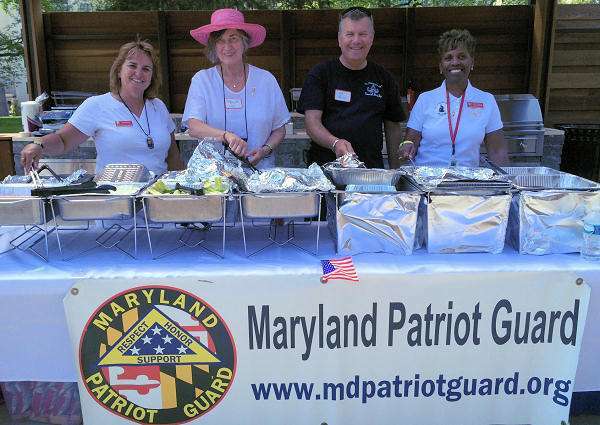 Members of the Maryland Chapter Michelle Murphy, Janice Chance, Donna Robinson and Theresa Mills joined The Maryland Patriot Guard Riders in sponsoring their Annual Bar-B-Q for the Wounded Warriors and their families at The Walter Reed National Military Medical Center at Bethesda. We once again had the Honor to serve them and spend time with them and their families. Maryland Chapter Mothers were invited to partner with the Maryland Patriot Guard and other organizations to assist with serving one of the wounded warriors a Marine Corp Sergeant and his unit that had recently returned for their deployment to Afghanistan. It was a Blessing to witness the moving reunion and an honor to serve them. 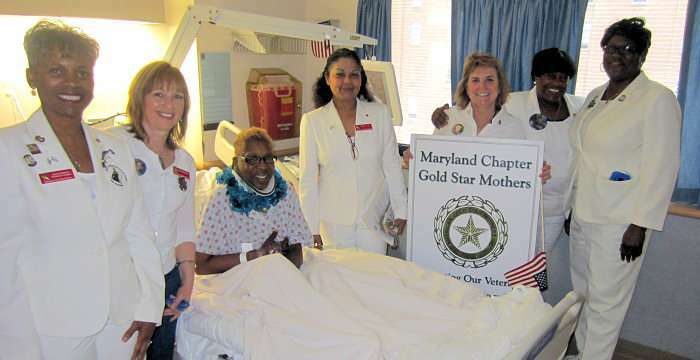 The following members participated: Theresa Mills, Mary O King, Robert Roddy, (husband of the late Carol Roddy, a Founder and former President of the new Gold Star Mothers Maryland Chapter, Inc) and Janice Chance. Gold Star family members were invited to meet BG Crawford and Mrs. Dianne Crawford, his wife, at an APG luncheon. 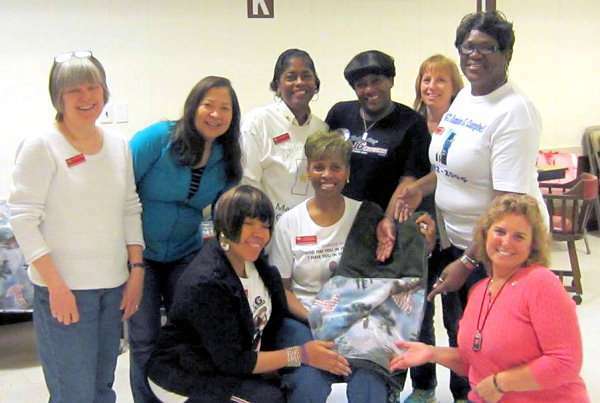 Pictured are Donna Robinson, Michelle Murphy, Dianne Crawford, BG Crawford, Janice Chance. Five moms from the Maryland Chapter had the honor of participating in a historic event the “Post 9/11 National Reading of the Names” at the National Mall in Washington, DC. Each mom was given a list of names for fifteen fallen heroes which included their beloved son or daughter’s name. The names of the mothers are as follows: Janice Chance, Paula Davis, Yvonne Green, Theresa Mills and Michelle Murphy. What was felt in the heart of each mom on that day is impossible to express with words. It was a deeply moving experience that will forever be indelibly etched in our minds and heart. Kelly Swanson, Janice Chance and Yvonne Green joined a large group of supporters at Cameron Park who participated in The Iraqi Children Foundation’s Annual 5K run/walk fund raiser to benefit Iraqi orphans and street children. After the run during the award presentation time the leadership team acknowledged and expressed their thanks for their participation. Corsages were pinned on each mom and special greetings was given by the Iraq Ambassador to the US Lukman Faily, former Iraq Ambassador Sumaida’ie, Ambassador and Deputy Assistant Secretary of State Richard Schmierer. 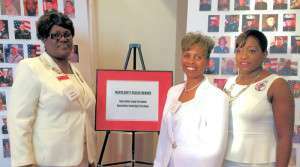 Several members from the Maryland Chapter along with other Gold Star families from the state of Maryland attended the American Red Cross (ARC) Chesapeake Region’s Hometown Heroes event on March 27, 2014 at the Lyric Theatre. The AMC honors local citizens and organizations that have worked in extraordinary ways to help others. We attended to support the family of one of our fallen heroes, Captain Sarah Knutson Cullen who was killed in action while serving our country in Afghanistan on March 11, 2013, as well as to support the other honorees. Members that also attended, are: Janice Chance, Donna Robinson and Michelle Murphy, Robert Roddy the spouse of the late Carol Roddy and father of David Roddy, and Kenmore Murphy spouse of Michelle Murphy and step father of Kendall Frederick. 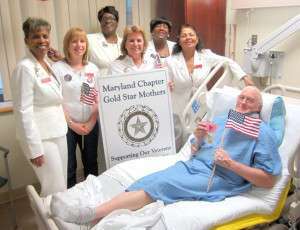 The Maryland Gold Star Chapter sewed 40 blankets for our Wounded Warriors in Walter Reed National Military Medical Center Bethesda (WRNMMC). These special blankets were delivered to our Wounded Warriors on March 17, 2014. 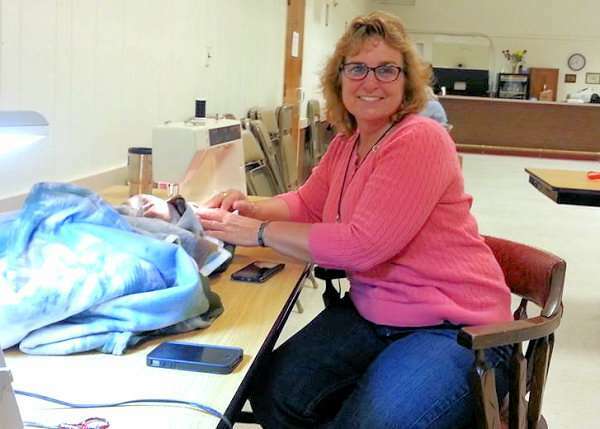 A special THANK YOU goes to the American Legion Post 60 in Laurel, Maryland for letting us use their hall for our meetings and sewing these special blankets. On February 15, 2014 several members of the Gold Star Mothers Maryland Chapter Inc. (Donna Robinson, Elsheba Khan, Janice Chance, Regina Barnhurst, Paula Davis, and Theresa Mills) participated in the Annual National Salute to Veterans Patient Week at the VA Medical Center downtown Baltimore location. The Annual Salute program began in 1978 when the VA took over sponsorship of a program started in 1974 by the humanitarian organization No Greater Love, Inc. Timed to coincide with Valentine’s Day, the National Salute observance connects the holiday’s sentiments of caring and sharing to expressing honor and appreciation to Veteran patients. We were honored to be able to visit with inpatients and their families in several of the units. Seeing the smiles on the faces of the patients and their family was heartwarming. Patients, their families and also the staff expressed their thanks with many kind words and gentle hugs. It was an honor to spend time with, express our appreciation and Salute some of our nation’s Veteran Heroes.